This low-cost PIP video generator provides users with 2 video feeds displayed on one screen for monitoring/recording purpose. Great video module for further integration with other video system for surveillance, video editing/capturing, post production, etc. The 2nd video channel window is inserted into the main video screen in real time. Users can monitor 2 video feeds at the same time. Never miss a move or a theme. The Picture-In-Picture split screen style and PIP position can be controlled by using the push buttons on the front panel. A fast input swap button is also provided for fast switching between the main and PIP input video channel. This unit can also be used as a 2-channel camera switch or video switch for visual presentation or surveillance applications. It is also a great add-on video module for applications related with video entertainment, video streaming and others. This PIP screen processor system is a real-time video processor, featured with dual-channel frame synchronized output. Both video inputs are synchronized accurately so the mixed video output can be displayed simultaneously for smooth and sharp pictures. The 2-channel split screen video processor can combine 2 composite video inputs into various style of split-screen views for presentation. Main video screen and PIP screen can be exchanged instantly by simply pressing the swap button on the front panel. This hotkey function is designed to provide fast switching between the main channel and the sub video channel. 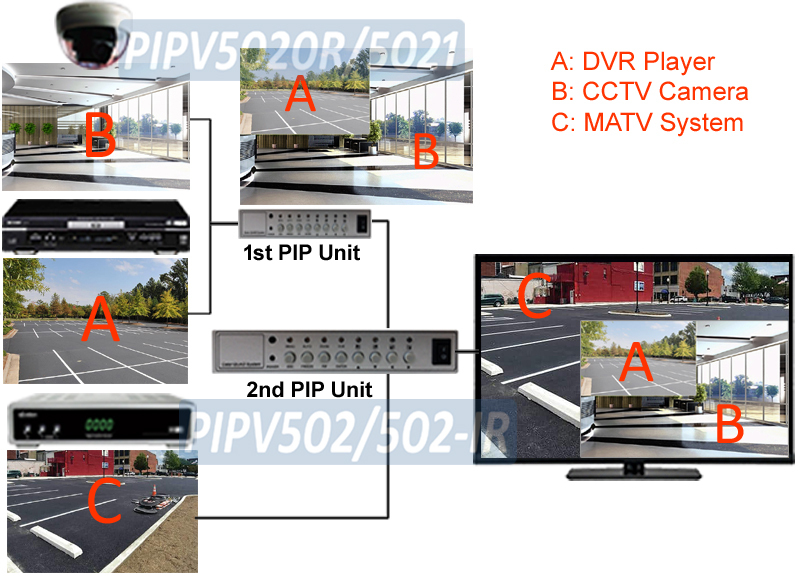 Users can easily turn the PIP screen into the large main channel screen on video monitor or TV right away while the original big screen main channel will be shrunk and becomes the PIP channel in small window screen instantly. This video image processor will memorize users' current selection in the system buffer once adjusted. The last-minute PIP screen mode will be displayed right away in the same configuration after power cycling or power outage. No need to select the desired screen mode again after the power is turned back on. Both video input channels can be presented in 13 matrix screen modes. 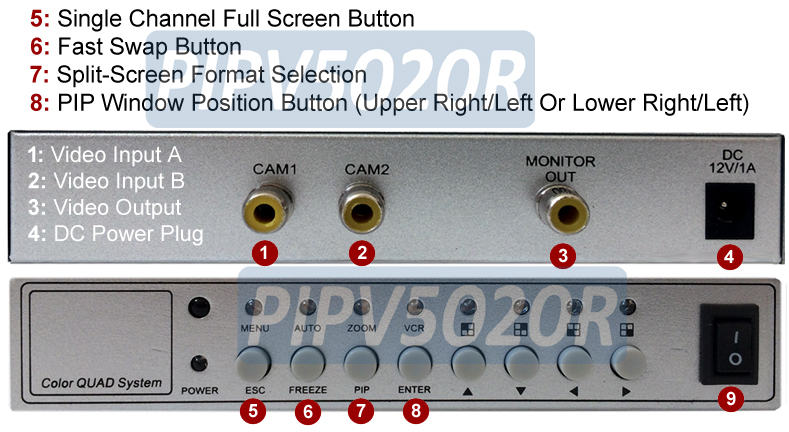 Fast video input swap between main video channel and the PIP channel via manual push button on the front panel. Easy installation and fast setup. The current screen mode will be memorized after the power-off. No need to select the desired screen mode again after the power-on. 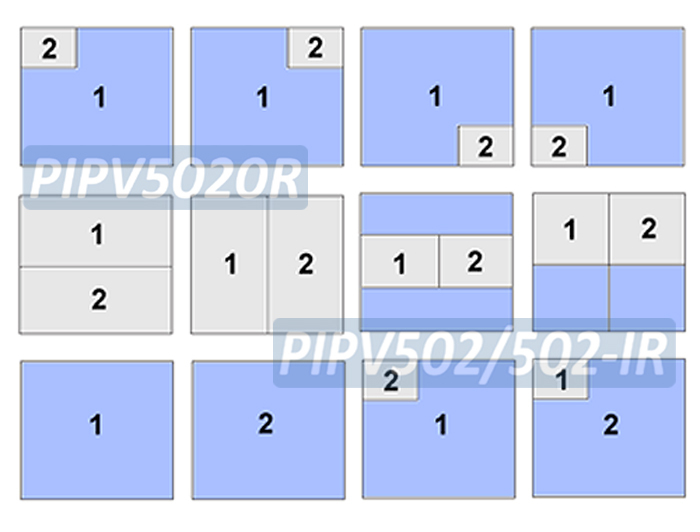 Multiple PIP units can be daisy chain connected together to process more video inputs or combined with other video mixers or A/V switches to form a large display system.